This is another of our top quality Heavy Duty 2 Run Dog Kennels. It measures 5'x10'x6'H and has a Fight Guard Divider for dog safety. Some breeds, and some dogs, bring with them a personality which adversly affects dog safety while in the kennel environment. They simply want to fight. So, we developed the Fight Guard divider. This solves the problem. 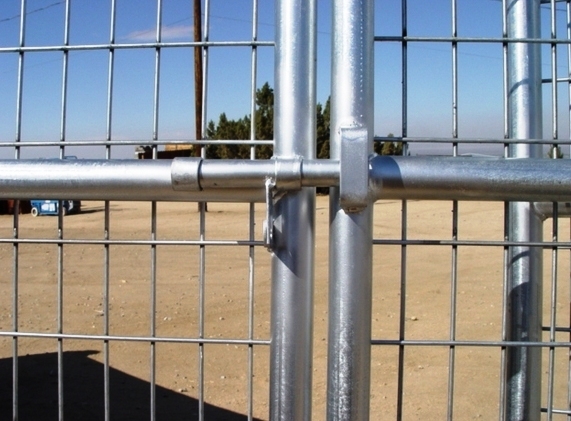 The Fight Guard Divider is simply a panel of 24 gauge sheet metal positioned between the dog runs to keep your dogs separated and free from harm.This added safety panel is used often by law enforcement K9 units. You know your dogs. You know whether you need a Fight Guard divider. We use the highest quality American made materials to insure top quality over a lifetime. 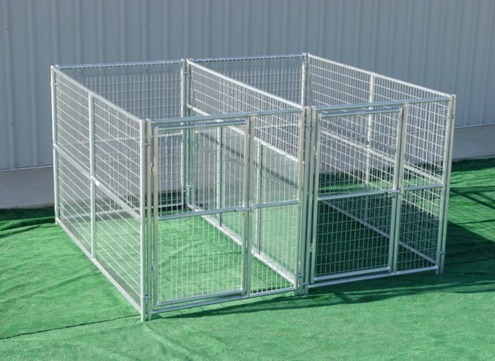 Our engineers have configured these strongest Dog Kennels using 16 gauge galvanized steel tubing and 6 gauge welded steel wire mesh. The result is a strong super-duty long lasting dog kennel ready to protect your valuable pets with style and safety. Backed by our 3 Year Replacement Warranty, our dog kennels provide many years of uninterupted service for you and your all important pets. If you don't see the size or configuration dog kennel you need, call us. We will custom build your next dog kennel to your specifications. Only $100.00 via LTL Truck anywhere in the contigous lower 48 states. We do not ship this product Internationally. If you are in Canada and need one of these very special Super-Duty outside dog kennels, we will be happy to ship to an address in a border town near you. You can then pick it up and take it home. 3-Year Full Manufacturer's Warranty and Terms and Conditions can be found here. **Shed Row style kennels have a 1-Year warranty. The same terms apply.